County and regional leaders will break ground today on eight major road construction projects totaling over $112 million at a special ceremony at the intersection of Mission Ridge Boulevard and Paseo del Este Drive in Far East El Paso County. The projects are part of the El Paso County Comprehensive Mobility Plan (CMP) adopted by the County Commissioners Court. In December 2013, County Commissioners Court, along with TxDOT representatives, developed a $400 million County Comprehensive Mobility Plan comprised of 16 major projects throughout El Paso County. The plan, which includes partnerships with the Camino Real RMA and TxDOT-El Paso District Office, will construct long overdue transportation infrastructure that is vital to the community’s growing needs. According to data provided by the U.S. Census Bureau, the population of areas outside the city limits grew from 113,118 in 2000 to 151,126 in 2010, nearly double the rate of growth inside the city limits. 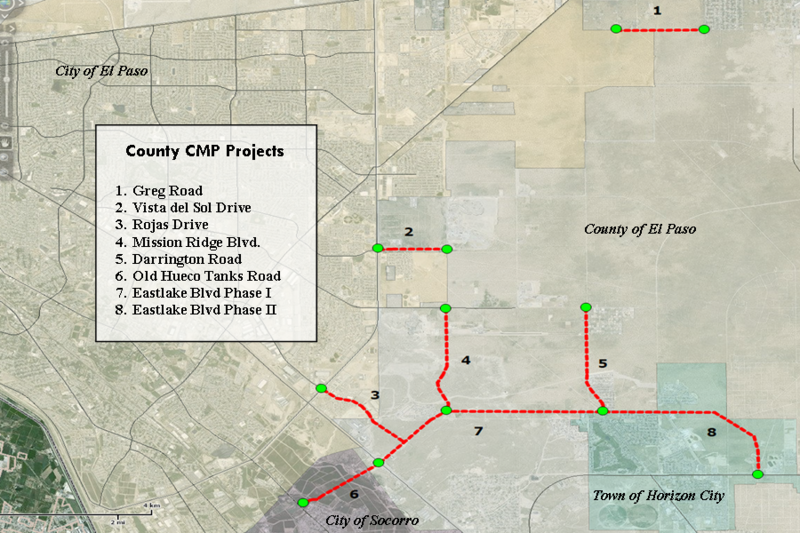 Through a formal agreement, the Camino Real RMA acts as the project manager for the County on this important transportation program and is charged with the entire process of project development, including design and construction. Other projects in the CMP include various operational/construction improvements along I-10 including the GO 10 Project on the Westside of town as well as improving connectivity between I-10 and the Border Highway. In total, the CMP ensures that projects from county line to county line are delivered as quickly and efficiently as possible in order to reduce traffic congestion as the county continues to grow. Commissioners Court fist began work on this initiative in September 2013 by voting to increase vehicle registration fees by $10. The optional fee increase was made possible by legislative changes made during the 83rd Legislative Session sponsored by State Senator Jose Rodriguez and Transportation Chairman Joe Pickett. Former Chairman of the Texas Transportation Commission, Ted Houghton, was also integral in leveraging additional funding for the $400 million Comprehensive Mobility Plan that made many critical projects possible.